For a moment I even thought I would be glad living back then. I like to be outside, watching things grow in my garden, cooking on fire (like these roasted bbq buns), … I would even like to go out hunting. I think it’s important to feel how your actions lead to a result you (hopefully) can be proud at. Then again that moment didn’t last long since my back called me back to reality. I’ve been writing this recipe in +-5 times because I need to lay down to rest my back. Luckily for me I have a comforting sofa and a lovely wife bringing some magazine’s, netflix series, … I don’t think this was possible in the good old days. Moreover I fear it would have become a daily grind to hunt, cook, … I often wonder for what reason people get used to positive things that fast. I see it as a daily task for myself to overlook the things I love and keep close in mind I appreciate them more than my brain makes me realize. Maybe we’re running to much through different impressions to make time for our brain overlooking this stuff? Anyway, this blog is helping me to make some time. 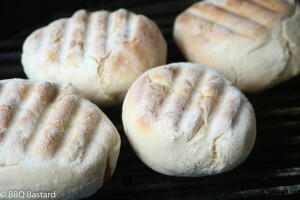 That’s why I want to share this awesome roasted BBQ buns I found on Mac’s page with you. I think you might like them! These Roasted BBQ Buns were still baking. In recipe below you’ll see them nicely tinted. 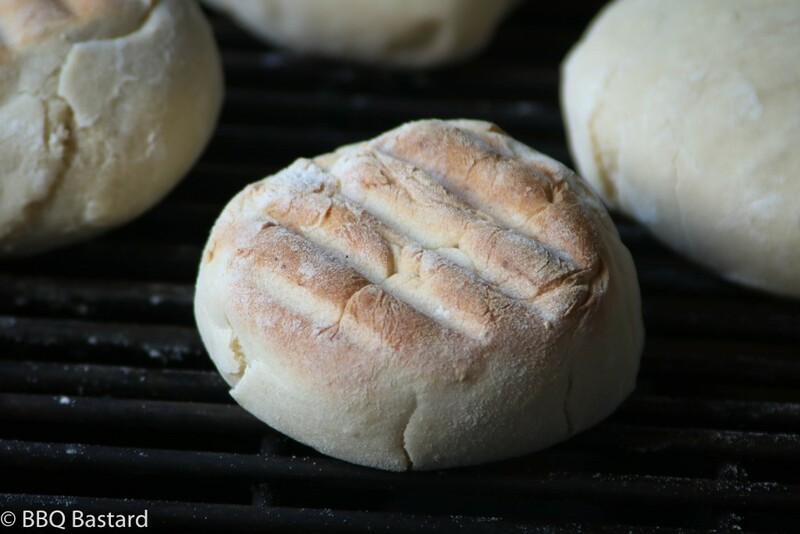 To make these delicious Roasted BBQ buns, you start by activating the yeast in 50gr. lukewarm water for about 10 minutes. Now the yeast is activating, set up your BBQ at +- 150°C. For this recipe we're going to cook over direct fire. While the fire is getting the right temperature, put the flour, sugar and salt in a large bowl. I start with the salt to make sure the yeast won't be killed. Actually it's not necessary since the yeast is activated but you never know. Make a little hole in the middle of the flour and pour in the olive oil. Now you can start mixing the ingredients by hand or use a machine. Since I got a really nice machine for our 5th wedding anniversary I could keep my hands clean. When using a machine make sure you use slow speed. While kneading the dough gradually pour in the water. The activated yeast water first. 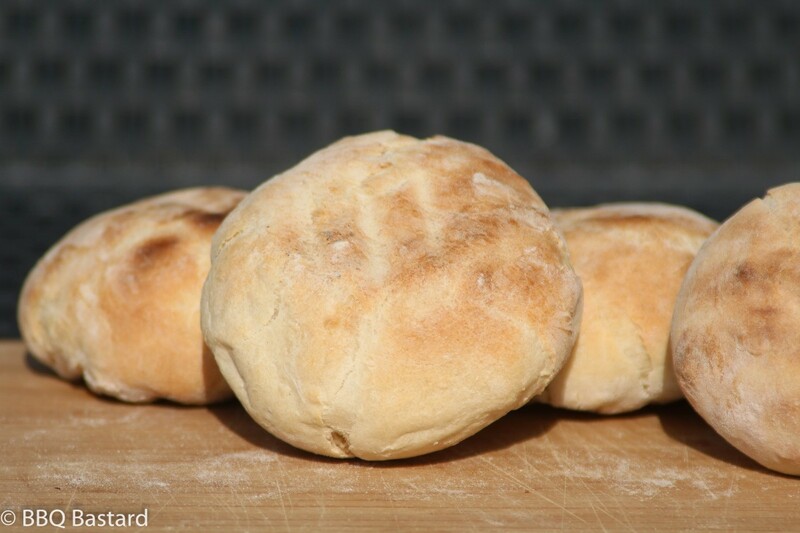 The dough is ready when you end up with a elastic soft dough. Next step: pour some flour or oil in a bowl to prevent sticking, put in the dough and cover it up with foil. Put the bowl in a warm place with stable temperature. 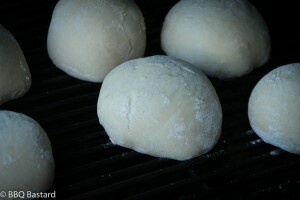 This step is done when the dough is doubled and keeps it's form after poking (meaning the dough won't rebound). It takes about a half hour to get there. Now the dough is ready you knead it for a last time and divide the dough in equal parts. I made six buns. Form the dough into equal balls and flatten them before putting them on the oiled grid. I did it on the grid after I had placed them all in the BBQ. That was not the best idea since they rise on the grid and I was a little too slow so I pushed out some air. This way they were a bit heavy first time I made them. When they're getting a nice colour at the bottom and some grillmarks start to appear, it's flipping time. Once the Buns sound hollow and are nicely tinted they're ready! All credits for this recipe go out to Mac from Mac's BBQ Pit. A wonderful dutch BBQ Blog. Please take a visit to his site and comment or give him the support he deserves. You should also check out his homemade dry aging machine!